Crossovers are hot in America. Low-riding SUVs like the Nissan Murano and Ford Edge that combine attributes of off-roaders, MPVs and estates are gaining market share rapidly. Ford believes Crossovers will account for more than 3 million sales a year in America by the end of the decade as more an more manufacturers jump on the bandwagon. Now manufacturers are starting to look further ahead to see what the next generation of Crossovers might look like. The current cars are aimed at younger family buyers – but as these owners grow older, they will look for something different. And Amereica’s population is ageing - by the end of the decade, there will be 57 million 50- to 64-year-old consumers - a 38% increase on 2000, according to the University of Michigan. Ten thousand Americans turn 50 every day. The Airstream is a far cry from the traditional truck-based RV. It has a hybrid powertrain, giving it a fuel consumption of 41mpg. 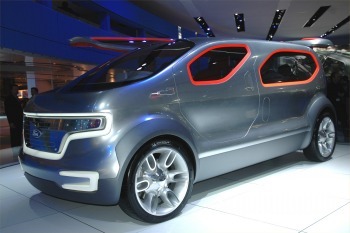 It can run for 25 miles as a pure electric car. Its styling owes as much to Stanley Kubrick’s sci-fi film 2001 as it does to the airstream trailers, featuring illuminated orange window surrounds and asymmetric doors. A similar layout is adopted on another crossover at the show aimed at ageing baby-boomers – the Nissan Bevel. This car is specifically aimed at 45-60-year-old men, generally “hobbyists” or DIY enthusiasts who want a car to carry their “stuff” around rather than their family. 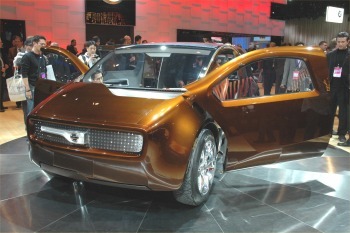 Nissan Design America designer John Cupit said the Bevel was a “category buster”. It’s aimed at people who don’t want an off-roader or an MPV – it’s for “men with hobbies – handymen and tinkerers”. Like the Airstream it has an asymmetric door layout, with a single offside driver’s door and wide-opening double “suicide” doors on the nearside, plus a rear tailgate that flips over to become a loading shelf. Another feature is its overt ‘70s styling, elements of which could become part of Nissan’s design “house style” in the future, especially the oblong grille incorporating the front lighting, and the configurable flat-panel dashboard. There are no plans to build either vehicle, though it’s good to see that manufacturers are looking beyond the current trends. Crossovers were only concept cars just a few years ago, so it would be no surprise to see cars like Airstream or Bevel as production models in the coming years.